Try one of our favorite comfort foods with a Barley Mushroom Risotto Recipe. 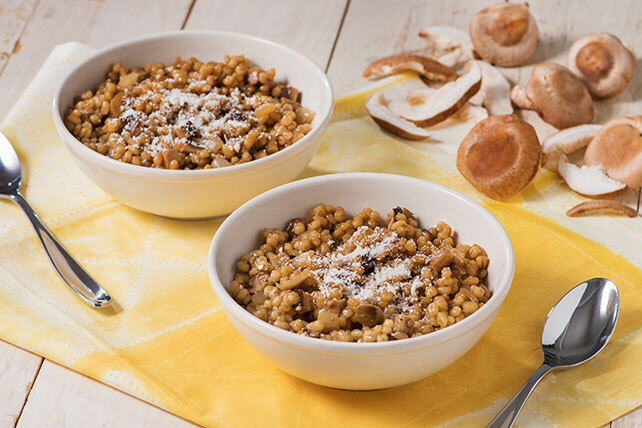 This Barley Mushroom Risotto Recipe is an elegant dish they will savor. Melt butter in 6-quart sauce pot on medium-high heat. Add oil, onion and garlic; cook and stir 5 minutes or until onion is tender. Add mushrooms and thyme; cook and stir 5 minutes or until mushrooms are tender. Stir in broth and barley; bring to boil. Reduce heat to medium-low; simmer 45 minutes or until barley is tender. Stir in half the cheese. Sprinkle with remaining cheese before serving. Store barley in an airtight container at room temperature for 6 to 9 months. If shiitake mushrooms are not available, use white button mushrooms or crimini mushrooms instead. 8 servings, about 2/3 cup each.